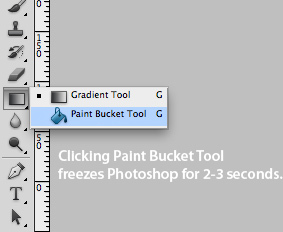 I'm running Photoshop CS 12.1 x64 on Lion (10.7.2) and whenever I switch between two grouped tools (like from Paint Bucket to Gradient), Photoshop freezes for 2 - 3 seconds right after clicking the new tool. This happens to all tools within any group, and there is no way that I can find to ungroup / expand tools into the toolbar (and thus not using groups in the first place). Toggling tools using shortcut keys works as expected, without any issues. Photoshop CS 12.0 x64 acts the exact same way, while Photoshop CS3 is not affected at all. Hmm, I haven't seen that one. Do you have any font management software installed like Suitecase, Font Explorer, etc? Nope, no font management software installed. Also it's pretty much a vanilla install of Photoshop (no 3rd party plugins, extensions, brushes etc.). That said, there is a lot of other software running at the same time, I'll try to close everything and see if the issue still persists. Since it doesn't appear to be a wide spread problem it could be some other program interfering and not a problem with Photoshop itself (oddly Flash is not affected), I'll report back if I find the culprit. Thanks for the quick replies! This program (Right Zoom) causes the 2-3 second delay when switching between grouped tools in Photoshop. Thankfully Right Zoom can add exceptions to certain programs so that it doesn't apply to them and adding Photoshop to the list fixes the issue. Thanks for the tip with the font management software, it got me on the right track into solving annoying matter.